In May 2018, California passed a law requiring that almost all new homes built in the state must have solar power after January 2020. California becomes the first state to pass such a law to support Governor Brown’s initiative to reduce carbon emissions by 40 percent by 2030 . This is a huge win for advocates of clean energy and the California Energy Commission, who passed the bill unanimously. Although critics argue that a solar requirement will drive the cost of homes up by an average of $9,500, industry officials say the amount will be more than made up in the form of lower energy bills . In fact, the commission estimates about $19,000 in energy and maintenance savings over 30 years . This subsidy to the homeowner does not even account for the environmental benefits solar panels provide. Solar energy is produced when photons, tiny particles of light emitted by the sun, hit atoms on the surface of the panels and knock their electrons free . Each panel contains what is known as a photovoltaic cell, with conductors attached to positive and negative sides. When sunlight hits the cell, these conductors form an electrical circuit and produce direct current (DC) electricity, as electrons begin to flow in one direction. An inverter is used to convert DC electricity, unusable by the electrical power grid, into alternating current (AC) electricity. The power grid uses AC electricity because it is less expensive and easier to transfer over long distances. 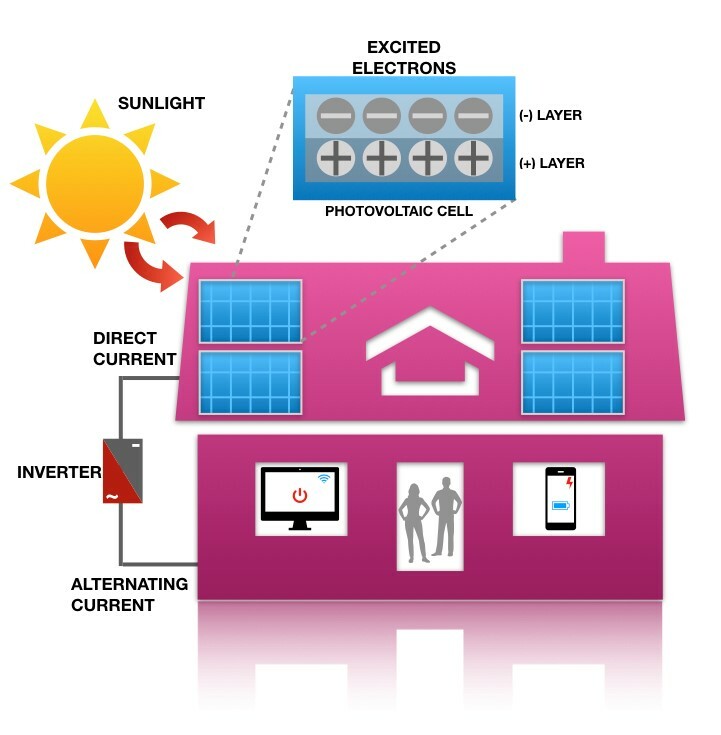 This electricity then flows from the panels into the system’s net meter for energy storage and use in the home. By harnessing the natural power of the sun, solar power systems generate pure energy, reduce dependence on fossil fuels, and limit greenhouse gas emissions . While the solar requirement in California may cause an initial financial burden on homeowners, the development of clean, renewable energy sources is crucial for the preservation of the environment.